You are here: Home » GABF Checklist: Busness Cards? Check! T-Shirts? T-Shirts?! T-SHIRTS?! GABF Checklist: Busness Cards? Check! T-Shirts? T-Shirts?! T-SHIRTS?! Well our fancy business cards are done, and with just hours to spare. They look great (disregard that bit of schmootz in the corner,the one in the pic’s been beat up a bit). I think we got about 500 of them, which means they should get us through the GABF and then the next 25 years or so. I have no idea what we’re gonna do with all of them. I’d like to thank Andy from East Coast Media for helping us out with these. 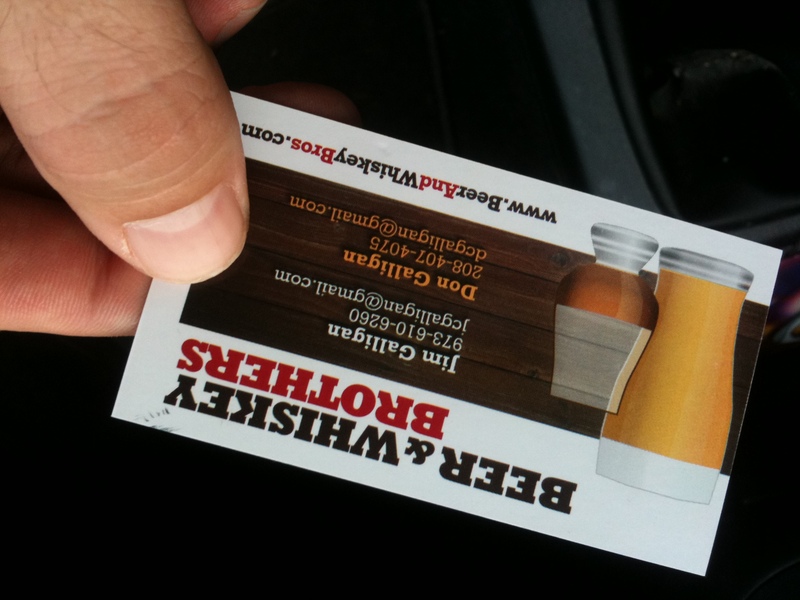 It’s great to find a beer guy who runs a top-notch printing place! The t-shirts are a more exciting story. Exciting in the chest-pumping-cliff-hanger-oh-my-god-I-don’t-need-this-stress kind of way. You see there was a manufacturing issue, and now our $51 t-shirts (that’s apiece!) are supposed to be waiting for us tomorrow morning when we check into our hotel in Denver. If not, I guess we’ll dress like normal beer guys. This stresses me out a bit, because I really didn’t plan ahead and grow some unusual facial hair. And I think there’s gonna be a lot of facial hair at this thing. I hope Don’s beard is big enough for the both of us. Also, did I mention I can’t find my wallet? The one with my Driver’s License and credit cards in it? Yeah, that could be a problem, too. Oh well, it wouldn’t be as exciting without a few crazy details to hammer down. That first beer tomorrow is gonna be amazing! ← Proof: Beer Is Good for Men’s Prostate Health. Don’t sweat it Jim, I’m sure you’ll make a great beard for Don. Or something like that. Anyway, the cards look great. Remember those you have left behind! Thanks, Scott. Found my wallet, so I figure the rest is gravy. We’re gonna try to do some updates as we go, but who knows? We’ve got this tiger by the tail.